On one Saturday evening we went to the city centre to have tapas when we heard a familiar tune, Semana Santa music played by a brass band. The Semana Santa celebrations finished a month ago (read more about it here) so why were we hearing its music? 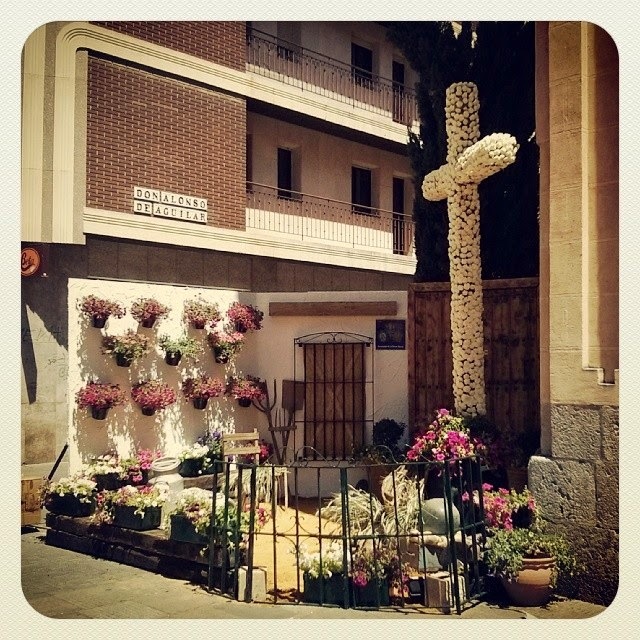 When we moved closer we saw a kind of mini-Semana Santa with a mini-cofradía, the Cruz de Mayo of Seville. When I saw that there was one organised in our neighbourhood as well, I dragged Paul along to see it. The whole procession was entirely made up of children, including the costaleros. The teenage boys who were carrying the paso seemed to carry themselves with the same air of importance as the adults which was quite sweet to watch. The children weren’t wearing nazareno outfits but instead the little girls were dressed in their flamenco costumes, which I found quite puzzling. They carried a smaller version of the candles as well which most of the time served as a walking stick or was made into a curious version of a wooden horse. Predictably, the procession was not very long, lengthwise or ‘distancewise’. Instead of the solemn behaviour of Semana Santa here the children looked decidedly … bored. After reading about this tradition I discovered that its origins come from two sources, one from Christianity (the search for the True Cross by St. Helen) and the other from a pagan tradition (May Day). The fiesta used to be a much bigger celebration but the above mentioned Semana Santa and the Feria de Abril took it over in importance and nowadays instead of a whole city affair it is only organised by neighbourhoods. Even though it is not a huge fiesta in Seville itself, in South-America, in Spain in general and even in other parts of Andalusia it is a well-known tradition. 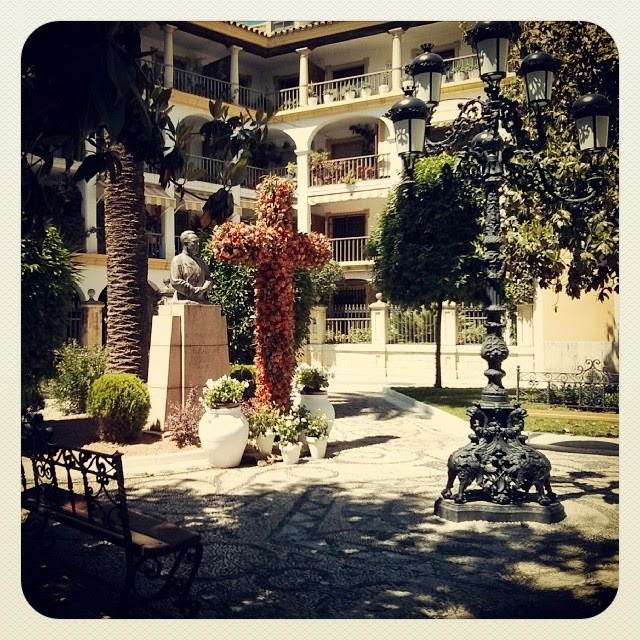 In flower-loving Córdoba, for example, during the Las Cruces de Mayo the crosses are decorated with flowers and displayed in courtyards and squares. Naturally, the most beautiful cross wins a prize and (more importantly) prestige. Of course, true to its Andalusian nature, the festival is celebrated with lots of eating and dancing. A special thank you to Salvador Sibaja Varo for the photos from Córdoba.